Is Your Roof Ready For Lexington's Winter Ice and Snow? Home » Blog » Home Improvement Tips » Is Your Roof Ready For Lexington’s Winter Ice and Snow? As we are all aware, Kentucky has it’s fair share of fluctuating weather patterns. Cooling weather temperatures for most of us in Lexington means wearing our favorite color “blue” and supporting our UK Wildcats! Winter weather can incur some significant damaging effects to your home. Whether you have a love or hate relationship with colder weather, it’s on the way! 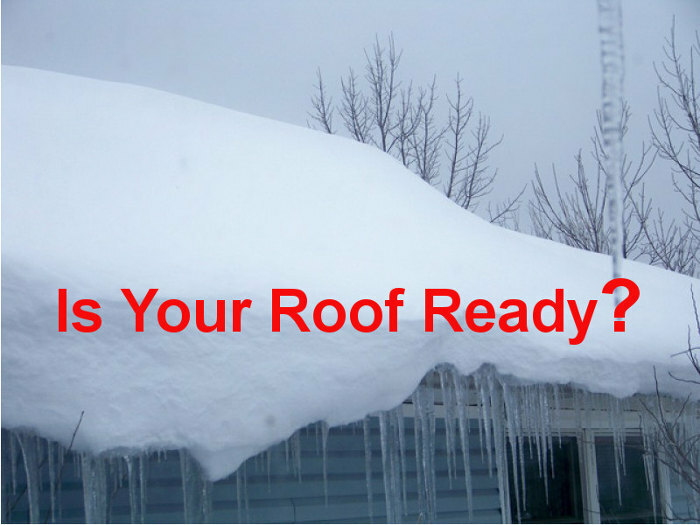 So, is your roof ready for Lexington’s winter ice and snow? How The Snow & Ice Can Damage Your Roof. If you want to know how the snow can cause damage visit this post on more specific damages caused by ice and snow. Want to see an example of a roof repair we did that was caused by the snow? You can visit this other post on the repair we performed. As with all industries, climates play a huge role in the design, building codes and local governing requirements for certain types of construction. In Lexington, for residential homes, there are no codes or regulations that are in place that require certain types of roofing materials to be installed in Fayette County with the exception of wood decking. Unfortunately, due to the lack of regulations, it leaves plenty of room for variations on quality and sub-standard installation methods. Wood rotted from a lack of care during the original installation. 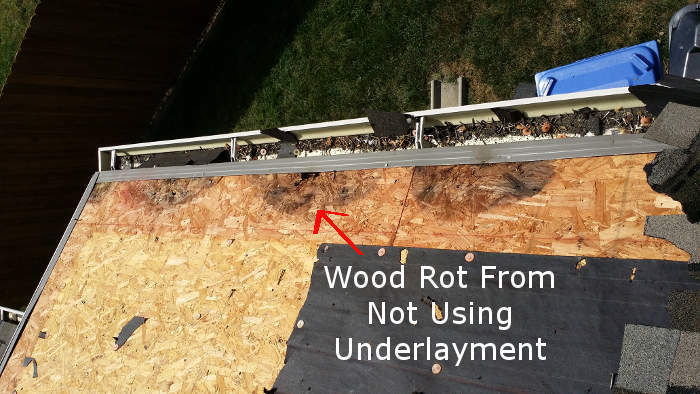 As you can see from the image above, there was a lack of care from the original roofer by not installing underlayment all the way to the edge. Does yours reach the edge? If you were to compare northern states with southern states, the common practices for installation methods would greatly differ from one another. Because we have no regulations in our area, in some cases roofs are installed with bare minimum installation methods. 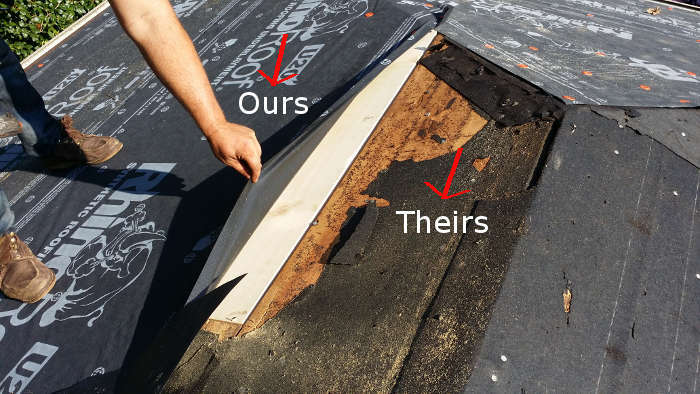 This simply means that unfortunately some roofers in Lexington only do what they have to in order to increase profit margins, while causing the homeowner to suffer the expense of future costly repairs. This is the material that is used between your wood decking and the shingles. It’s primary application is to prevent water from penetrating your wood decking. You can see the difference in quality between our underlayment and their underlayment. 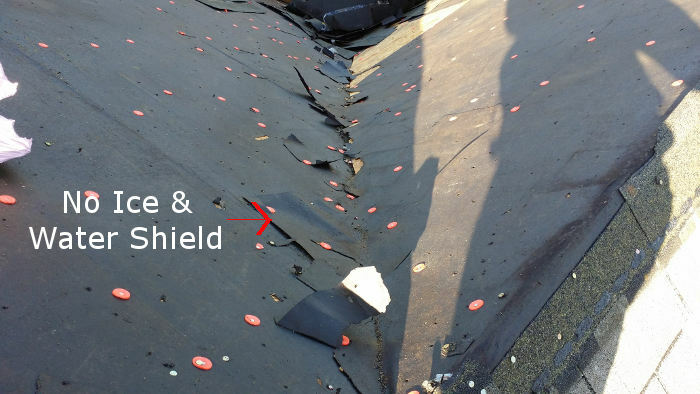 Ice & Water Shield is an additional preventative roofing material that is designed to repel water penetration in the valleys or angles of your roof. It’s commonly used to prevent wind driven rain and damaging effects of ice dams. 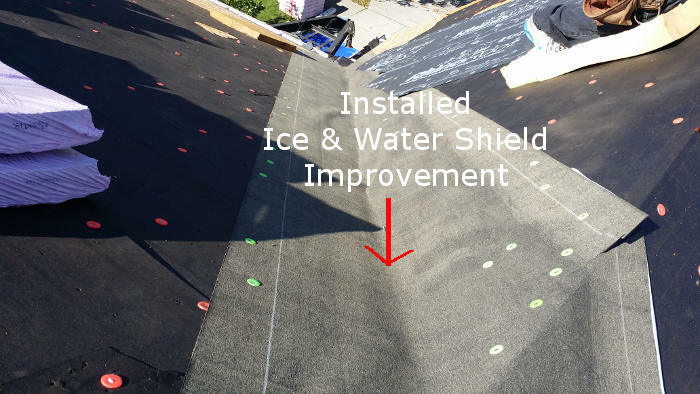 The following images are before and after photos of us installing ice and water shield because it was not originally installed. Before with no ice & water shield. After with ice & water shield installed. Roof Flashing is usually an aluminum or steel material that is applied along the walls and joints of your roof. It has a primary purpose of preventing water, ice & snow from penetrating the adjoining areas between the edge of where your shingles meet another surface. The following is an image of one of these types of shortcuts. 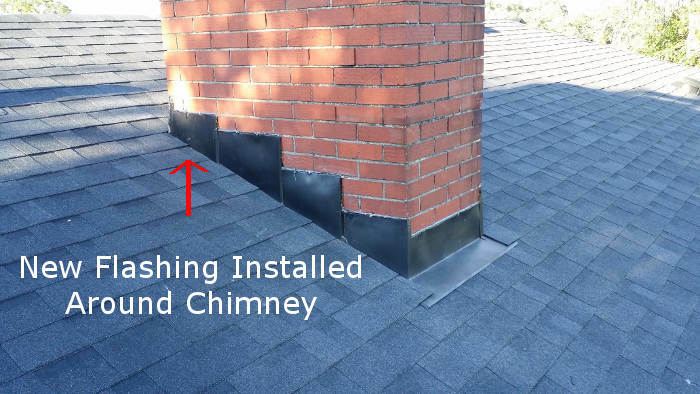 As you can see, there is no flashing installed around this chimney. 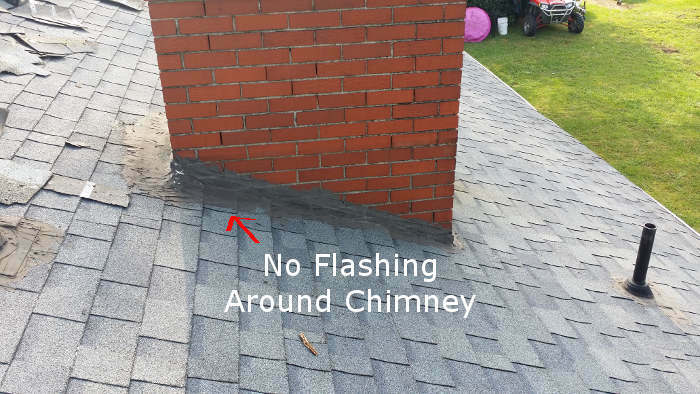 No flashing installed around this chimney. In the process of repairing this roof we correctly installed new flashing around the chimney. Repaired roof and installed new flashing around chimney. These above mentioned examples are only a few reasons why your roof may be at risk. If you’re not sure it’s ready for winter weather you can request a free estimate. When it comes to knowing what’s underneath, it’s hard to visually determine. At Lexington Blue, we do have methods of detection to determine if your roof is well protected from the elements. Inspecting a roof for materials that can handle the snow & ice. You can request a FREE Evaluation Here. 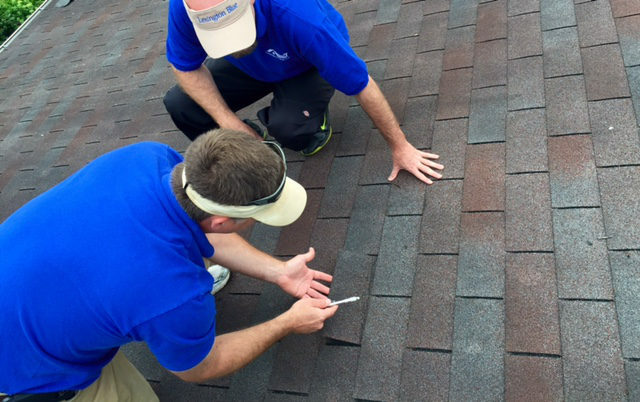 We inspect each component of your roof to determine if it’s prepared to take on mother nature’s worst. At the very least this will give you the peace of mind knowing your protected for years to come. We use non-invasive methods of detection to the best of our ability. The only other way to know for sure is through photo documentation. Not very often, if ever do we find that homeowners have this type of information. With each install we perform, we keep adequate documentation on file should a homeowner ever require it. If it becomes apparent your roof needs attention, we can help! We can make simple improvements that avoid the expense of an entire roof replacement. Most improvements involve simply adding materials that should have been installed initially. These can include the following. Remove existing shingles in and around valleys. Check quality of wooden decking. Install a new layer of protection with our high end ice & water shield. Remove existing shingles & flashing (if any). Add a new layer of high quality synthetic felt. Install new flashing or step flashing around the perimeter’s edges. These improvements, although they come with an expense, are far less expensive than the damage that can and will occur to your home if your roof isn’t prepared for the snow and ice. Maybe you’ve been fortunate so far, but maybe this season will show the real proof of what’s not underneath. Sometimes it can take years before the warning signs begin to show. We can help before it’s too late! Lexington Blue has been providing homeowners in Lexington, KY with superb customer service that’s backed by quality workmanship. We take great pride in performing our services with a commitment to doing it right! If you’re not sure or simply want to rest peacefully at night, contact us to make certain your roof is ready for Lexington’s winter ice and snow. Emergency roof repair service in Wilmore, KY.